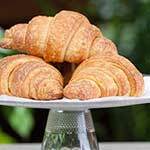 From the sourdough croissant dough we create plain and almond croissants, as well as pain au chocolat. Making delicious almond frangipane from scratch will also be covered in class. Easy olive oil sourdough pastry which will take you seconds to do will soon become your ‘go to’ pastry for both sweet or savoury pastry.